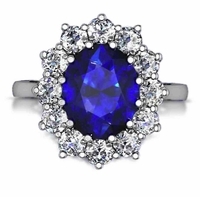 The Kate Middleton Man Made Sapphire Oval Halo Cluster Cubic Zirconia Engagement Ring has inspired Ziamond to design a version especially for you utilizing our finest quality lab created man made sapphire and highest quality Russian formula cubic zirconia set in your choice of 14k gold, 18k gold or platinum. On November 16, 2010, the Royal Family of England happily announced the engagement of Prince William to his girlfriend of many years, Kate Middleton of Berkshire. Prince William and Miss Middleton were in Kenya when the Prince proposed marriage. 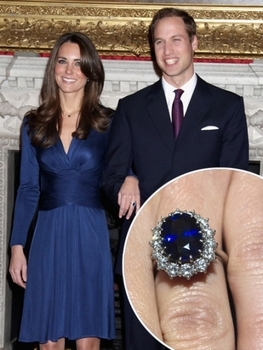 Prince William proposed with the same exquisite Blue Sapphire and Diamond Ring that his father Prince Charles bestowed upon his mother Princess Diana in February of 1981. This sentimental engagement ring that adorned Princess Diana's finger and now Miss Kate's finger was valued over $60,000 when Prince Charles gave it to Princess Diana, undeniably its value now is undeniably priceless today. Needless to say we can not all afford a priceless ring such as this, however Ziamond's version of Kate Middleton'e engagement ring is made with the same meticulous details and amazing quality. In addition , since we are the manufacturer, we are offering this gorgeous Kate Middleton style engagement ring in various carat sizes that would suit any desire. See below for the options we offer.